Vigils, protests, and arrests marked the one-year anniversary of the Cleveland police shooting death of 12-year-old Tamir Rice. In anticipation of a verdict from a grand jury, #YearWithoutTamir social media messages called for a new prosecutor. On Sunday, the Rice family joined with supporters for a vigil at the Cudell Rec Center, where on November 22, 2014, Tamir Rice was shot within two seconds of the police’s sudden arrival and died the next day. He was playing with a plastic toy gun. Monday brought more activism across the country. In New York City and Brooklyn, some protesters were arrested. No arrests were reported on the Manhattan Bridge, despite claims that it was shut down. 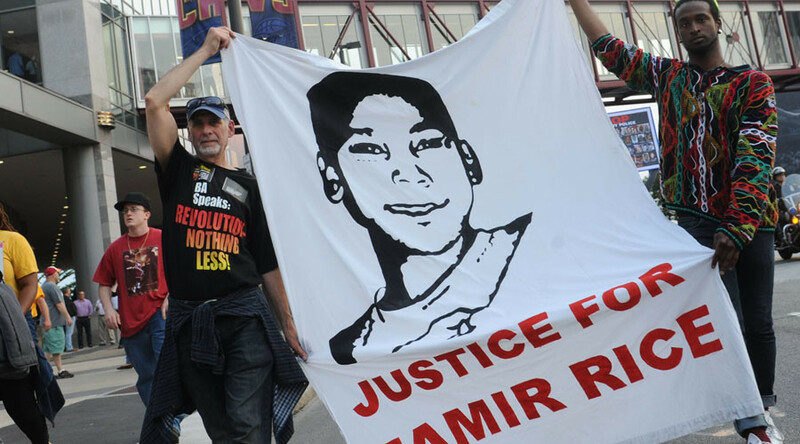 Back in Cleveland, at the Cavaliers-Magic basketball game, some activists called for a moment of silence for Tamir Rice. Arrests were reportedly made here, too, including Angela Peoples, co-director of GetEQUAL, an LGBT activist group. Also on Monday, a march in downtown Cleveland demanded that Prosecutor Tim McGinty be removed from the grand jury case. Walter Madison, the Rice family attorney, is confident McGinty will not garner any charges for the Cleveland police. “Well, it's real simple. It's an example of how closely prosecutors and police officers work everyday. They have this symbiotic relationship, whereby it has fostered over the years a reluctance, an unwillingness to hold them responsible and accountable when they commit crimes as well. And it's nothing short of, other than an evil misuse of justice,” Madison told RT. Groups in East Bay, California; Denver, Colorado; Philadelphia, Pennsylvania; and Columbia, Maryland joined in solidarity with the Rice family. “And at the end of the day, it is just so disrespectful to their public office as servants,” Madison continued, referring to the prosecutor’s office and the police department. “It is disrespectful to the concept of justice, and, you know, it's very difficult for them to turn around and expect people to respect their authority, when they can't simply respect their position, the state of Ohio, the laws of the United States. It is utterly disrespectful, and they ought to be ashamed." Cleveland Municipal Judge Ronald Adrine organized a meeting at his office on November 17 to address policy regarding mass arrests in the event that riots break out as a consequence of the grand jury verdict. No one from the police department showed up, saying they matter had already been covered in previous meetings, though some in attendance were angered by the absence. Adrine called for another meeting, which is set for December 9.